253-841-5457 www.puyallupparksandrec.com PARKS & RECREATION DEPARTMENT 808 VALLEY AVENUE NW PUYALLUP, WA 98371 Partnership Opportunities — There are many different ways your business can partner with us through the many activities, events and sports we offer to the community. Ranging from the popular concert series, to supporting the youth scholarship program to sponsoring a youth sports team there is something for all sizes of companies and organizations. To learn more about partnering with us contact Deon Moyd at 253-841-5457. 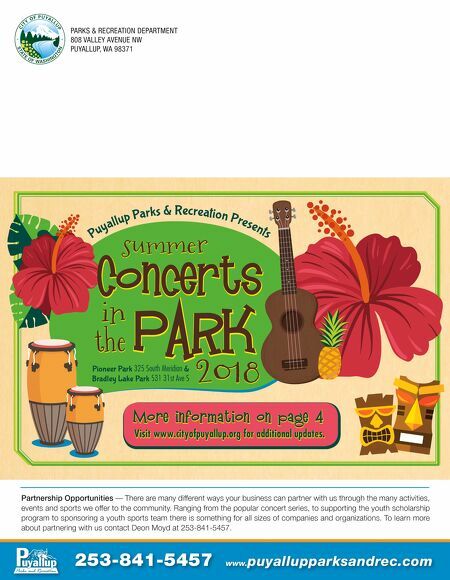 PARK in the Concerts summer Puya ll up P a r ks & R e c r ea ti o n Pr es en ts Pioneer Park 325 South Meridian & Bradley Lake Park 531 31st Ave S 2 0 18 More information on page 4 Visit www.cityofpuyallup.org for additional updates.